Spartan Emperor Historic Sword With Sheath 2 for 1 | BUDK.com - Knives & Swords At The Lowest Prices! Bring the ferocity of the 300 Spartan warriors into the 21st century with this historically inspired Spartan Emperor sword! 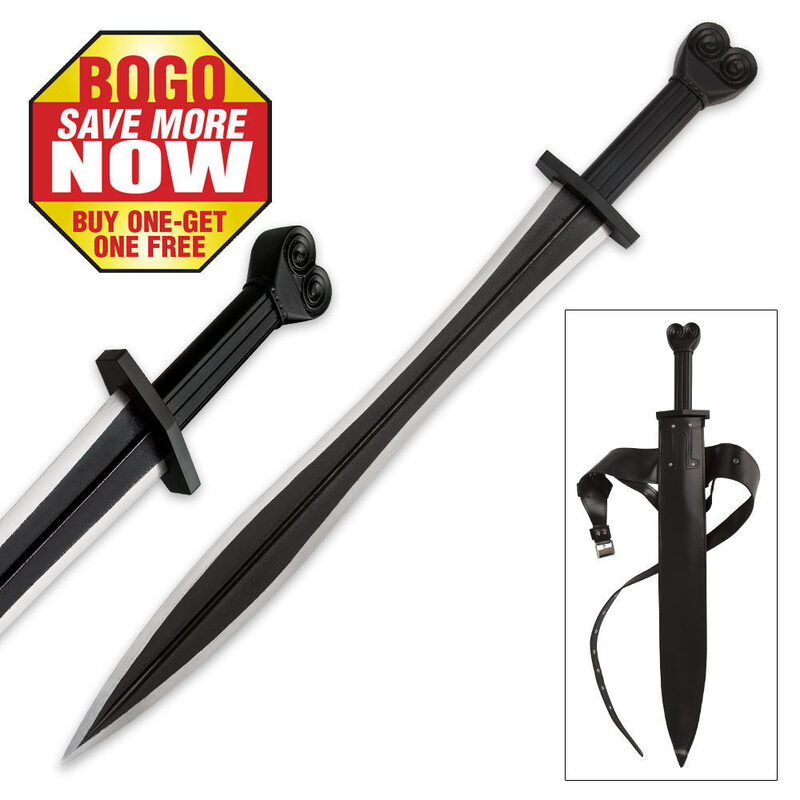 This 31-1/2" sword features a 23-1/2" steel blade with an oxidized finish for an old-world look and feel. The cast metal alloy and iron fittings and accents add further authenticity to this unique design. It comes to you with a deluxe soft scabbard that can be carried on the shoulder. You will receive to Spartan Emperor swords with this purchase. BK2605. Heavier than I thought. Blade has non sharp areas.. I used my knight sharpener to get a sharp blade. Good thrusting power. Can take one's head off with no problems. The seath ,,,I don't understand.. Nice sword.. Good length....Good handle. Very strong. Like I said,,,,a bit heavy,,,good thrusting power. The 2 for 1 great deal. I un wraped one put the other one on hold. Over all I like it. unpacked this today and could hardly believe how heavy this sword was. Great looking and you cannot go wrong with buy one,get one free deal. Amazing Deal. Plan to give the other to my son-in law for his birthday, maybe. Thanks Bud-K for the great sword and deal. Amazing. Ok since the first guy to comment made no sense. I'll tell you, the sword is a very sturdy piece of metal. Decent edge out of box, and it's a perfect wall hanger or costume piece. Great for the money. This is the best sword I have ever owned plus the second one. It is nearly razor sharp super sturdy kinda heavy. The sheath on the other hand is just for looks, the sword pretty much cut in half and not a balenced sword but other than that best set I have ever owned.